Received September 19, 2018; Revised December 14, 2018; Accepted February 6, 2019. Vitis vinifera is very susceptible to downy mildew (Plasmopara viticola). A number of authors have suggested different genetic populations of this fungus exist in Europe, each showing a different degree of virulence. Work performed to date indicates this diversity to be the result of different factors. In areas where gene flow is greater and recombination more frequent, the diversity of P. viticola appears to be wider. In vineyards isolated by geographic barriers, a race may become dominant and produce clonal epidemics driven by asexual reproduction. The aim of the present work was to identify the conditions that influence the genetic diversity of P. viticola populations in the vineyards of northwestern Spain, where the climatic conditions for the growth of this fungus are very good. Vineyards situated in a closed, narrow valley of the interior, in more open valleys, and on the coast were sampled and the populations of P. viticola detected were differentiated at the molecular level through the examination of microsatellite markers. The populations of P. viticola represented in primary and secondary infections were investigated in the same way. The concentration of airborne sporangia in the vegetative cycle was also examined, as was the virulence of the different P. viticola populations detected. The epidemiological characteristics of the fungus differed depending on the degree of isolation of the vineyard, the airborne spore concentration, and on whether the attack was primary or secondary. Strong isolation was associated with the appearance of dominant fungal races and, therefore, reduced populational diversity. - Plot A: situated in a narrow, closed valley of the interior (strongly isolated); Denomination of Origin (D.O) area: Ribeira Sacra; variety grown = Mencia. In May and again in July of 2014, 30 leaves with symptoms of downy mildew (i.e., with primary infection symptoms in May [single sporulating lesions known as oil spots], and secondary infection symptoms in July [mosaic patches]) were collected from each plot (Table 1) for SSR analysis of the P. viticola present. The experimental vineyard was tended to following standard production practices, except for the application of fungicides specific for, or with residual activity against, P. viticola. No treatments were applied to any plot, however, until all sampling for field susceptibilty to P. viticola (veraison) was finished. 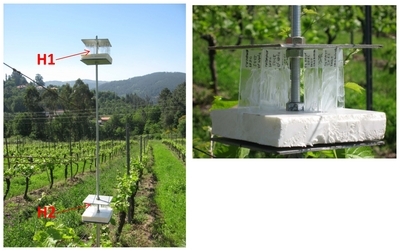 During the above sampling period, airborne spores (sporangia) of P. viticola were also collected in the different plots using sticky glass traps (four traps to a support stand) facing N, S, E and W (Fig. 2). Two supports were placed in each vineyard at different altitudes (if possible), and the traps (A and B) they carried at two heights (1 and 2 m) above the soil. All traps were replaced twice per month. Removed traps were examined by light microscopy (20× and 40×) after staining the sporangia with acidic lactofucsin (0.1% lactofucsin in lactic acid). Sporangia belonging to P. viticola were identified and the number in each trap noted. Between May and September 2014, the incidence of disease on the grapevine leaves and clusters in each plot was recorded using the method of Boso et al. (2005, 2011). Leaf and cluster symptoms were respectively examined 3 weeks after the onset of flowering and before veraison, in 20 plants per plot. In both cases, sampling was performed when more than 50% of the varieties showed symptoms of disease. Disease incidence was defined as the (number of leaves or clusters with symptoms/total number of leaves or clusters) × 100. Soil temperature, air temperature (mean, maximum and minimum), leaf temperature, rainfall, relative humidity, solar radiation and other variables were measured using automatic μMCR200METOS agroweather stations (Pessl Instruments Ltd., Weiz, Austria) in each plot over the study year (2014). Frozen tissue of each sample was disrupted using a Retsch ®Mixer Mill MM 300 (Retsch GmbH, Haan, Germany) and DNA isolated using the Qiagen DNeasy Plant Mini Kit (Qiagen, Basel, Switzerland). It was then quantified in a Nanodrop 2000 spectrophotometer (Thermo Scientific, Wilmington, DE, USA), and its integrity confirmed in agarose gels. The presence of P. viticola DNA was examined by amplifying the GIOP marker (Valsesia et al., 2005). Genetic variation among the fungal samples was analyzed by PCR amplification of the ISA, CES, GOB, BER, Pv13, Pv17, Pv31 microsatellites (Delmotte et al., 2006; Gobbin et al., 2003b). Amplification was performed in a Bio-Rad MyCycler Thermal Cycler (Bio-Rad Laboratories, Hercules, CA, USA), using 1 μl of extracted DNA, 1 U of Kapa Taq (Kapa Biosystems, Boston, MA, USA), 0.32 mM of total dNTP, 0.08 μmol of each labelled forward primer (BER-F and ISA-F labelled with D2 dye, Pv13-F, Pv17-F and Pv31-F with D3 dye, and GOB-F and CES-F with D4 dye [Invitrogen, Inchinnan, Scotland, UK]), 0.25 μmol of non-labelled forward primers, and 0.4 μmol of the reverse primers (see Supplementary Table 1 for full information on primers), adding PCR buffer (10 mM Tris-HCl pH 7.2, 50 mM KCl) to a final reaction volume of 20 μL. The reaction conditions were as follows: an initial cycle of 95°C for 5 min, followed by 38 cycles of 30 s at 95°C, 30 s at 56–58°C (depending on the primer pair; see Supplementary able 1), 50 s at 72°C, and a final extension of 10 min at 72°C. The resulting amplicons were separated in a 6% acrylamide/bis-acrylamide (19:1) gel in the presence of Gel Red® Gel-Red (Biotium, Hayward, CA, USA) to confirm the presence of amplicons in each sample. Gel images were digitalized using the VisiDoc-it™ Imaging System 6.4 LCD system and visualized using Quantity One v.4.6.6 software (BioRad Laboratories, Hercules, CA, USA). 0.5 μl of the amplified fragments (1 μl for the GOB fragment) were run in an automatic sequencer with 40 μl of deionised formamide (Beckman-Coulter, Krefeld, Germany) plus a D1-labelled 60–420 bp CEQ DNA size standard (Beckman-Coulter, Krefeld, Germany) to determine the fragment sizes. These sizes were assigned using a CEQ 8800 Genetic Analysis System (Beckman-Coulter). The heterozygosity, polymorphism information content (PIC), number of expected and observed alleles, and the diversity for each microsatellite locus, was examined using PowerMarker v.3.25 software (Liu and Muse, 2005). GeneAlex v.6.5 software (Peakall and Smouse, 2006, 2012) was used to calculate the Nei genetic distances among populations, along with other population genetics indices. Microsoft® Excel 2007/XLSTAT© v.2016.04.32217 software (Addinsoft, Inc., Brooklyn, NY, USA) was used to conduct principal coordinates analysis (PCA) in order to examine the genetic relationships among and within populations. Table 2 shows the maximum and minimum temperatures, the mean temperature, rainfall and relative humidity (RH) values for the different plots. Plot C showed the most favourable climatic conditions for fungal growth over the sampling period (RH 70–75%, rainfall 62.2–105.2 mm Tmax < 27°C) (Gessler et al., 2011). The conditions in Plot B were less favourable (RH 60–65%, rainfall 26.2–37.6 mm, Tmax 30–37°C). In general, the highest airborne sporangia concentrations were recorded in May in all plots. Plot D had the highest concentration, followed by B, C, and A (Table 3, Fig. 3). The damage caused by downy mildew in the study period was less than that normally seen in the plot areas. The high and low temperatures at different moments in the growth cycle limited the development of P. viticola (especially in June and July in Plots A, B and D). In these plots, symptoms of disease were seen on both the leaves and clusters, although disease incidence was < 25%. In Plot C, disease incidence was > 25%, and reached 70% in early sampling (primary infection) (Table 4). It may be that the fungal population affecting Plot C was more aggressive than those in the other plots, or that the grapevine variety in Plot C (Albariño) was more susceptible. Kast (2001) suggests that fungal ‘races’ show different levels of aggressiveness depending on the grapevine host variety, i.e., different genetic populations of P. viticola show greater affinity towards some varieties than others. Our group is currently studying this possibility. Amplification of the GIOP marker confirmed P. viticola to be present in amplifiable quantities in 68 of the 240 leaf samples collected. Table 5 shows that Plots C and D (those with the highest incidence of disease) returned the highest proportions of infected leaves (both primary and secondary infections). Plots C and D (especially) also returned the largest number of airborne sporangia. SSR analysis returned a different number of alleles for each plot, depending on the marker in question. Table 6 shows the number of alleles, number of genotypes, major allele frequency, heterozygosity, and PIC etc. for each SSR and plot (primary+secondary infection). GOB was expected to be the most polymorphic marker, as indicated by the size range of the amplicons (Supplementary Table 1). Forty nine GOB alleles and 116 different GOB genotypes were identified (Table 6). The PIC value for this marker was 0.94. The GOB allele number for the different plots and for primary and secondary infection ranged from 3 to 20 - sometimes with as many as 7 alleles recorded for the same sample (Table 5). When combinations of alleles were generated to determine the number of different fungal populations present in each sample, the GOB marker returned up to 54 - which hardly seems realistic. It would seem that despite being a very informative SSR marker (Gobbin et al., 2003b), GOB is not so valuable in analyses of population genetics, at least in the present setting. GOB was therefore left out of all subsequent analyses. The total possible number of fungal genotypes was therefore generated using the remaining markers. CES returned the highest number of alleles (14), and the highest PIC (0.77), but the lowest allele frequency for the major allele (0.33) (Table 6). Pv13 and Pv31 were not very polymorphic, returning PICs of 0.19 and 0.31 respectively. All plots showed similarities with respect to the percentage of polymorphic loci, the number of effective alleles, and the unbiased expected heterozygosity for all the SSRs (GOB) taken together (Table 7). The number of genotypes detected for the primary and secondary infection populations differed greatly between plots: Plot A had 7 primary and 3 secondary infection genotypes, Plot B had 5 primary and 5 secondary infection genotypes, Plot D had 23 primary and 37 secondary infection genotypes, and Plot C had 18 primary and 28 secondary genotypes. These differences may have several explanations, but in Plot D the most important influence may have been the high airborne spore concentration (Table 3). In addition, Plots D and C were those with the greatest incidence of disease, which may have provoked the appearance of more genotype diversity. Plot A was located on a steep, terraced slope (> 30%) of a closed, narrow valley. It might be speculated that, in such an environment, air currents that would bring in fungal spores may have been restricted, effectively isolating the vineyard from inward gene flow and reducing the diversity. This might facilitate the appearance of dominant fungal races that produce clonal epidemics driven by asexual reproduction (Koopman et al., 2007; Rumbou and Gessler, 2004, 2006). The other three vineyards were flatter, although each had its peculiarities. Plot B was far away from other vineyards and surrounded by houses; it too was therefore isolated. The remaining plots, C and D, were open and surrounded by other vineyards; it was in these plots that the greatest populational diversity was seen, perhaps due to the free movement of spore-carrying air currents. This would have promoted gene flow between the populations, giving rise to more opportunities for genetic recombination. It should be remembered that the climatic conditions of Plot C were more propitious for the growth of P. viticola. In plots A, B and D the temperature surpassed 30°C in June and July (the time of secondary infections), inhibiting fungal growth. This could have reduced the appearance of diversity. The plot with most genotypes also had the highest number of private alleles, except for the primary infection samples from Plot B, which had five fungal haplotypes and just one private allele (Table 7). The Shannon index was in general low and very similar for the different plots; the highest values were obtained for secondary infection samples from Plots B and D. It is remarkable that the samples from Plots D and C showed mainly negative fixation index values, while Plots A and B returned positive values. These results agree with the proportions of observed heterozygotes, which was greater than expected for the former two plots and smaller than expected for the latter two. The genetic differentiation reflected by the fixation index also reveals that the genetic structure might be related to the degree of plot isolation due to the surrounding geographical barriers. The genotypes in Plot A largely correspond to dominant races that produce clonal epidemics driven by asexual reproduction. To examine the development of the infection over time, PCA was performed for each plot separately, taking into account primary and secondary infection individually. These analyses showed the first three axes to explain from 70.55% (Plot D) to 89.96% (Plot A) of the variance. The fungal populations of Plot C grouped by primary and secondary infection, but this was not seen for the other plots (Fig. 4). The populations associated with secondary infection in Plot C might not have arisen from those involved in primary infections, but from spores arriving on air currents from elsewhere. They may also have appeared as the result of recombination, or, as some authors suggest (Jermini et al., 2003, 2009; Matasci et al., 2008), have been the product of oospores that had remained latent in the soil until June. Some authors (Jermini et al., 2009; Pertot and Zulini, 2003) report the existence of greater genetic diversity for P. viticola during primary infection. In the present work, however, this was only observed for the most isolated plot, Plot A. In fact, in Plots C and D, more genetic diversity was seen during the period of secondary infection. Table 8 shows the pairwise population matrix for the Nei genetic distances between the plots. The largest genetic distances were between Plot C and Plots A/B, both for primary and secondary infection. 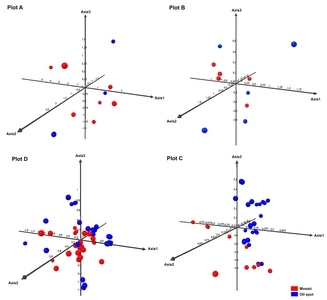 The smallest genetic distance was between Plots A and B, both for both primary and secondary infection; in fact, the intraplot distances for both primary and secondary infection were larger. In conclusion, wide populational diversity was detected for P. viticola. The epidemiological characteristics of each plot were driven by factors such as the degree of isolation, the airborne spore concentration, and by whether the infection was primary or secondary. This agrees with observations of other authors that different races of P. viticola exist in different vineyards across Europe (Gobbin et al., 2003b, 2006; Stark-Urnau et al., 2000). The appearance of dominant races would appear to be a consequence of isolation (Koopman et al., 2007; Rumbou and Gessler, 2004, 2006). This work was funded by the Fundación Juana de Vega. The authors thank the Adegas Moure (D.O. Ribeira Sacra), Bodega Terras Gauda (D.O. Rias Baixas, subzone O Rosal), Félix Estévez (D.O. Monterrei) and Bodegas Pazo Casanova (D.O. Ribeiro) wineries for their collaboration, and Iván González and Elena Zubiaurre for technical assistance. Fig. 1. Plot locations and terrain type. Fig. 2. Airborne sporangia capture using sticky glass traps facing N, S, E and W. Two supports (A and B) were placed in each plot (at different altitudes if possible), and the traps they carried at two heights (H1 and H2 m) above the soil. Fig. 3. Micrographs of airborne sporangia (magnification 40×). Plot D had the highest concentration, and Plot A the lowest. Fig. 4. PCA performed for each plot separately, taking into account primary (oil spot) and secondary infection (mosaic spot). Two supports were placed in each plot (at different altitudes if possible), and the traps they supported (A and B) at two heights (1 and 2 m) above the soil. *Mean number fungal genotypes per sample inferred from the combination of alleles. In parenthesis: maximum number of fungal genotypes per sample. N: Sample number; Na: N° of different alleles; Ne: N° of effective alleles = 1/(Sum pi2); I: Shannon Index; Ho: Observed heterozygosis; He: Expected heterozygosis; uHe: Unbiased expected heterozygosity = (2N/(2N−1))*He; F: Fixation index = (He−Ho)/He = 1−(Ho/He). Abu Z. 1878. Agriculture book . Scientific Literature Library, Sevill, Spain. 512 pp (in Spanish). Boso S, Santiago JL, and Martínez MC. 2005. A method to evaluate downy mildew resistance in grapevine. Agron Sustain Dev 25: 163-165. Boso S, Alonso-Villaverde V, Santiago JL, Gago P, and Martínez MC. 2011. Susceptibility of 44 grapevine (Vitis vinifera L.) varieties to downy mildew in the field. Aust J Grape Wine Res 17: 394-400. Chen WJ, Delmotte F, Richard-Cervera S, Douence L, Greif C, and Corio-Costet MF. 2007. At least two origins of fungicide resistance in grapevine downy mildew populations. Appl Environ Microbiol 73: 5162-5172. Delmas CE, Fabre F, Jolivet J, Mazet ID, Richard-Cervera S, Deliére L, and Delmotte F. 2016. Adaptation of a plant pathogen to partial host resistance: selection for greater aggressiveness in grapevine downy mildew. Evol Appl 9: 709-725. Delmotte F, Chen WJ, Richard-Cervera S, Greif C, Papura D, Giresse X, Mondor-Gemson G, and Corio-Costet M-F. 2006. Microsatellite DNA markers for Plasmopara viticola, the causal agent of downy mildew of grapes. Mol Ecol Notes 6: 379-381. Delmotte F, Machefer V, Giresse X, Richard-Cervera S, Latorse MP, and Beffa R. 2011. Characterization of Single- Nucleotide-Polymorphism markers for Plasmopara viticola, the causal agent of grapevine downy mildew. Appl Environ Microbiol 77: 7861-7863. Delmotte F, Mestre P, Schneider C, Kassemeyer HH, Kozma P, Richard-Cervera S, Rouxel M, and Deliére L. 2014. 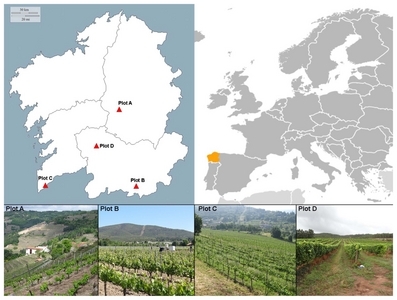 Rapid and multiregional adaptation to host partial resistance in a plant pathogenic oomycete: evidence from European populations of Plasmopara viticola, the causal agent of grapevine downy mildew. Infect Genet Evol 27: 500-508. Délye C, and Corio-Costet M-F. 1998. Origin of primary infections of grape by Uncinula necator. RAPD analysis discriminates two biotypes. Mycol Res 102: 283-288. Evans KJ, Whisson DL, Stummer BE, and Scott ES. 1997. DNA markers identify variation in Australian populations of Uncinula necator. Mycol Res 101: 923-932. Fontaine MC, Austerlitz F, Giraud T, Labbé F, Papura D, Richard-Cervera S, and Delmotte F. 2013. Genetic signature of a range expansion and leap-frog event after the recent invasion of Europe by the grapevine downy mildew pathogen Plasmopara viticola. Mol Ecol 22: 2771-2786. Gessler C, Pertot I, and Perazzolli M. 2011. Plasmopara viticola: a review of knowledge on downy mildew of grapevine and effective disease management. Phytopathol Mediterr 50: 3-44. Gobbin D, Pertot I, and Gessler C. 2003a. Genetic structure of a Plasmopara viticola population in an isolated Italian mountain vineyard. J Phytopathol 151: 636-646. Gobbin D, Pertot I, and Gessler C. 2003b. Identification of microsatellite markers for Plasmopara viticola and establishment of high throughput method for SSR analysis. Eur J Plant Pathol 109: 153-164. Gobbin D, Jermini M, Loskill B, Pertot I, Raynal M, and Gessler C. 2005. Importance of secondary inoculum of Plasmopara viticola to epidemics of grapevine downy mildew. Plant Pathol 54: 522-534. Gobbin D, Rumbou A, Linde CC, and Gessler C. 2006. Population genetic structure of Plasmopara viticola after 125 years of colonization in European vineyards. Mol Plant Pathol 7: 519-531. Gobbin D, Bleyer G, Keil S, Kassemeyer H-H, and Gessler C. 2007. Evidence for sporangial dispersal leading to a single infection event and a sudden high incidence of grapevine downy mildew. Plant Pathol 56: 843-847. Hug F. 2005 Genetic structure and epidemiology of Plasmopara viticola populations from Australian grape growing regions. Diploma’s thesis . ETH Zurich, Switzerland. Jermini M, Gobbin D, Blaise P, and Gessler C. 2003. Influence of the overwintering methods on the germination dynamic of downy mildew (Plasmopara viticola) oospores. IOBC-WPRS Bull 26: 37-42. Kast WK, Stark-Urnau M, Seidel M, and Gemmrich AR. 2001. Inter-isolate variation of virulence of Plasmopara viticola on resistant vine varieties. Bull OILB/SROP 24: 45-49. Kennelly MM, Eugster C, Gadoury DM, Smart CD, Seem RC, Gobbin D, and Gessler C. 2004. Contributions of oospore inoculum to epidemics of grapevine downy mildew (Plasmopara viticola). Phytopathology 94: S50. Kennelly MM, Gadoury DM, Wilcox WF, Magarey PA, and Seem RC. 2007. Primary infection, lesion productivity, and survival of sporangia in the grapevine downy mildew pathogen Plasmopara viticola. Phytopathology 97: 512-522. Koopman T, Linde CC, Fourie PH, and McLeod A. 2007. Population genetic structure of Plasmopara viticola in the Western Cape Province of South Africa. Mol Plant Pathol 8: 723-736. Li X, Yin L, Ma L, Zhang Y, An Y, and Lu J. 2016. Pathogenicity variation and population genetic structure of Plasmopara viticola in China. J Phytopathol 164: 863-873. Liu K, and Muse SV. 2005. PowerMarker: Integrated Analysis Environment for Genetic Marker Data. Bioinformatics 21: 2128-2129. Matasci C, Gobbin D, Schärer H-J, Tamm L, and Gessler C. 2008. Selection for fungicide resistance throughout a growing season in populations of Plasmopara viticola. Eur J Plant Pathol 120: 79-83. Miazzi M, Hajjeh HR, and Faretra F. 2003. Observations on the population biology of the grape powdery mildew fungus Uncinula necator. J Plant Pathol 85: 123-129. Peakall R, and Smouse PE. 2006. GENALEX 6: Genetic analysis in Excel. Population genetic software for teaching and research. Mol Ecol Notes 6: 288-295. Peakall R, and Smouse PE. 2012. GENALEX 6.5: Genetic analysis in Excel. Population genetic software for teaching and research-an update. Bioinformatics 28: 2537-2539. Péros JP, Troulet C, Guerriero M, Michel-Romiti C, and Notteghem JL. 2005. Genetic variation and population structure of the grape powdery mildew fungus, Erysiphe necator, in Southern France. Eur J Plant Pathol 113: 407-416. Peressotti E, Wiedemann-Merdinoglu S, Delmotte F, Bellin D, Di Gaspero G, Testolin R, Merdinoglu D, and Mestre P. 2010. Breakdown of resistance to grapevine downy mildew upon limited deployment of a resistant variety. BMC Plant Biol 10: 147. Pertot I, and Zulini L. 2003. Studies on Plasmopara viticola oospores germination in Trentino, Italy. Integrated protection and production in viticulture. IOBC-WPRS Bull 26: 43-46. Rouxel M, Papura D, Nogueira M, Machefer V, Dezette D, Richard-Cervera S, Carrere S, Mestre P, and Delmotte F. 2012. Microsatellite markers for characterization of native and introduced populations of Plasmopara viticola, the causal agent of grapevine downy mildew. Appl Environ Microbiol 78: 6337-6340. Rumbou A, and Gessler C. 2004. Genetic dissection of Plasmopara viticola population from a Greek vineyard in two consecutive years. Eur J Plant Pathol 110: 379-392. Rumbou A, and Gessler C. 2006. Particular structure of Plasmopara viticola populations evolved under Greek island conditions. Phytopathology 96: 501-509. Scherer E, and Gisi U. 2006. Characterization of genotype and mating type in European isolates of Plasmopara viticola. J Phytopathol 154: 489-495. Stark-Urnau M, Seidel M, Kast VK, and Gemmrich AR. 2000. Studies on the genetic diversity of primary and secondary infections of Plasmopara viticola using RAPD/PCR. Vitis 39: 163-166. Stummer BE, Zanker T, Scott ES, and Whisson DL. 2000. Genetic diversity in populations of Uncinula necator: comparison of RFLP- and PCR-based approaches. Mycol Res 104: 44-52. Valsesia G, Gobbin D, Patocchi A, Vecchione A, Pertot I, and Gessler C. 2005. Development of a high-throughput method for quantification of Plasmopara viticola DNA in grapevine leaves by means of quantitative real-time polymerase chain reaction. Phytopathology 95: 672-678. Yin L, Zhang Y, Hao Y, and Lu J. 2014. Genetic diversity and population structure of Plasmopara viticola in China. Eur J Plant Pathol 140: 365-376. Zheng Y, Xu S, Liu J, Zhao Y, and Liu J. 2017. Genetic diversity and population structure of Chinese natural bermudagrass [Cynodon dactylon (L.) Pers.] germplasm based on SRAP markers. PLoS One 12: e0177508.